(Phys.org)—Physicists have found the strongest evidence yet for no violation of Lorentz symmetry, one of the fundamental symmetries of relativity. Lorentz symmetry states that the outcome of an experiment does not depend on certain aspects of its surroundings, namely the velocity and the direction of its moving reference frame—properties that become relevant when studying astronomical objects and launching satellites, for instance, as well as for unifying quantum mechanics and general relativity. "We know that general relativity and the Standard Model of particle physics are not the ultimate theories," coauthor Marie-Christine Angonin at the Paris Observatory told Phys.org. "Furthermore, so far, it has been impossible to conciliate in one common theory these two aspects of physics. To succeed in this quest, almost all unification theories predict a breaking of Lorentz symmetry." 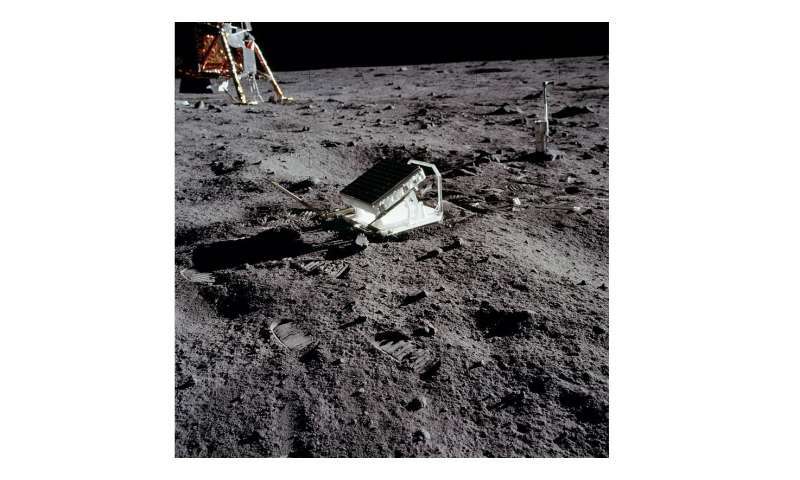 To perform the improved test of Lorentz symmetry, the team of physicists from the Paris Observatory and the University of California, Los Angeles, analyzed 44 years of data from lunar laser ranging (LLR) observations. LLR involves sending laser pulses between a station on the Earth to a reflector on the Moon and back, and measuring the time it takes for the light to complete the round trip, which is roughly 2.5 seconds. Modern LLR experiments can determine the distance between the Earth and Moon to within less than a centimeter. In the new study, the researchers analyzed data from more than 20,000 reflected laser beams sent between 1969 and 2013 by five LLR stations located at different places on the Earth. The round-trip travel time of the light is influenced by numerous factors, from the location of the Moon in the sky, to the weather and the tides, as well as relativistic effects—which are especially important for testing Lorentz symmetry. In order to analyze the LLR data in the context of Lorentz symmetry, the researchers first developed a "lunar ephemeris," which is a model that accounts for dozens of factors to compute the estimated position, velocity, and orientation of the Moon with respect to the Earth at any given time. The framework for this ephemeris comes from a theory called the standard-model extension (SME), which combines general relativity and the Standard Model of particle physics, and allows for the possibility of Lorentz symmetry breaking. "For the first time, a global modeling of the Earth-Moon system has been done in the SME framework," Angonin said. "This means that the SME equations of motion have been included in the ephemeris as well as in the light trajectory description. It leads us to derive complete and robust constraints on the SME coefficients and consequently on a hypothetical breaking of Lorentz symmetry." Overall, the researchers' analysis shows that LLR data are sensitive to certain combinations of the SME coefficients, but found no evidence that LLR depends on the velocity or the direction of its reference frame, indicating no Lorentz symmetry breaking. Due to the vastness of the data, the results provide the most stringent constraints yet on the SME coefficients, in some cases improving them by up to an order of magnitude over previous research. In general, improving these constraints means that any violation of Lorentz symmetry must be very small, if it exists at all. In the future, the researchers plan to continue to search for violations of Lorentz symmetry using other astronomical data. "We wish to combine the data from LLR with those from satellite ranging or Moon exploration, and consider more evolved models where the breaking of Lorentz symmetry arises from the coupling between matter and gravity," Angonin said. The unidirectional aspect of time, in situ (as it is - in the observed macro world), which is quantum to Newtonian macro.... is a frighteningly obvious violation of Lorentz Symmetry. Umm yes. Circular exclusive compartmentalized logic. Works every..uhm.. time. What does any of that even mean? And how the hell does it even relate to the article? You know, here's an idea: If you don't know what Lorentz symmetry means (let alone the words 'Newtonian' or 'quantum, 'comparrtmentalized' or 'logic'') then don't post. How about that? Not posting would make you look infinitely smarter. I don't see the correlation. Right. But is it cosplay if they fail to 'dress up'? It's like someone cosplaying as superman while wearing the underwear over their face. "Those damned educated types don't know what the hell they talkin' about...so we must be right!" ...and now we face an era when the world's most important decisions will be made by and voted on by the sizable block with their own private facts, validated by fake news and that other idiots are making the same errors. "Those damned educated types don't know what the hell they talkin' about...so we must be right!" Universities can blame themselves. There are plenty of "studies" programs led by incoherent morons with PHDs who's "scholarship" is judged by their equally incoherent peers with PHDs and treated as if it's rigorous because it's sponsored by Universities. We now have college students that are unable to handle unpleasant ideas and that do not possess the critical thinking skills to refute such ideas with facts and reason. Instead, they retreat into safe spaces. Such students are not worthy of respect. There are plenty of "studies" programs led by incoherent morons with PHDs who's "scholarship" is judged by their equally incoherent peers with PHDs and treated as if it's rigorous because it's sponsored by Universities. That a pretty strong accustaion. Care to back that up? Particularly: care to back that up with anything that shows that this is prevalent. they retreat into safe spaces. It's hard to play it safe in science. after all: to get a grant you have to show a proposal of what you intend to research. And this includes - particularly - where your research delves into the unknown. it's impossible to play it completely safe if you have to go into the unknown. I could cite more studies programs at high profile schools, but I'm limited to 1000 characters, so it's not like a large list can be created with full citations and whatnot. Out of these studies programs, the idiotic concept of intersectionality in race, class, and gender that create systems of oppression is a central theme. Due to space limits I'll just list a few prominent schools at which news worthy safe space protests have occurred in the last few years: U of Missouri, Yale, Harvard, UC Berkley, U of Michigan. Speakers have been banned at Brown U, Cal State, UC Berkeley, U of Chicago, U of Pennsylvania, Virginia Tech, and others in 2016 alone. Oh, and that's just in the US. definitions (word meanings), are compound, spacially and authoritatively relative, and temporally evolving. ... almost as distinct as institutions and teachers, and pretty much the point of equations. ref: stanford, princeton, mit, cambridge, gottingen, basel, konigsberg, paris etc. you dismissed him without refutation, and admitted you didn't comprehend it too boot. Translation: Words can mean whatever the hell anyone wants them to mean? Is that really what you are saying here? you didn't comprehend it too boot. There is nothing to comprehend there. Randomly strung together scientese words do not make an argument. The language of science is one thing above all: precise. That's the whole point. Someone who doesn't even understand that is certainly not going to make a contribution to....anything. If you can't use the words with their defined meanings then you're somewhere in the esoteric camp talking about non-defined terms like 'spiritual energies', 'souls', 'gods' and all that kind of nonsense. Like many physics experiments: This result seems more about confirming or disproving assumptions than a genuine expectation of new physics. Lorentz symmetry and its corresponding conservations of mass/energy and momentum was hardly likely to show anomalous results on such a large scale and with relatively poor ~1cm resolution. Lasers experiments in high vacuum and with sub-atomic resolution are more likely to measure Lorentz symmetry violations as realism becomes suspect at smaller scales. Regarding the criticisms of education in other posts: Many weird and implausible theories are being seriously explored at present ( e.g. multiple universes created by probabilistic events) as underlying reality is sought. Even disproving some of these may yield new and useful ideas and methods. It makes sense that free particles would act as waves, and trapped particles, defined as atom would behave with a different ruleset. It would also mean that an atom vibrates because the wave particles that make it want to keep going but cannot. The link is as simple as that. The problem is we don't understand mass or gravity enough to "fully" comprehend the link. For instance, nobody can rule out if mass arises from an atom; trapped particles. They think there's a special particle, "Higgs" but they really have no idea. Also personally, I don't know how physicist know how many quarks are in an atom; to rule out shear number of quarks being the reason for mass. When making round trip measurements to test a violation of the Lorentz Symmetry, wouldn't any violation, if there is any, cancel themselves out? Isn't the red and blue shifting of light a violation of Lorentz Symmetry? Imagine traveling in a spaceship at 1/2c. This ship has a light source in the center and observers at both ends. Would they both see the same color of light? Wouldn't the red and blue shifting of light require they see different colors? And if so, wouldn't this be a violation of the Lorentz Symmetry? Couldn't this also be use to measure the ships velocity if there is a difference? I misstated where the observers would have to be, they would have to be outside the spaceship. Let me try it another way. What if we replaced the observers with finely tuned atom clocks and measure the time it took for the light to reach the front and back of the spaceship. In this case since light should be red and blue shifted wouldn't there be a apparent difference in the measured speed of light, faster to the rear and slow to the front? Science can't even describe thermodynamics. Something that wiser heads have been ringing the alarm about --for a very long time. The fundamentals utilized are an unsolved riddle.. But, of course, these who speak on it.. get swatted down by those who like order and control. Or, a smarmy troll of the clique class enters the fray and says something witty for the benefit of his caste group, to keep them endorphined into place via said redundant positive reinforcement horseshit. inasmuch as they are travelling at the same velocity as the center - they would both see the same. WG, I agree, that is why I posted the following: What is the answer to that question? "I misstated where the observers would have to be, they would have to be outside the spaceship. Let me try it another way. What if we replaced the observers with finely tuned atom clocks and measure the time it took for the light to reach the front and back of the spaceship. In this case since light should be red and blue shifted wouldn't there be a apparent difference in the measured speed of light, faster to the rear and slow to the front?" Yes the clocks would be with the ship, inside or outside. This light source to a stationary observer would appear blue-shifted approaching and red-shifted leaving. So traveling at 1/2 c the distance for the light to reach the front clock would be 50% longer and the distance to reach the back would be conversely 50% shorter for the light waves to reach the clocks. If so, how can they both measure the light reaching them at the same time thereby measuring the same light velocity? this is not CTP violation. That observers in different reference frames will not agree in their measurements is the whole point of special relativity. In this case both clocks are in the same reference frame. My question is would both clocks measure the same velocity for the speed of light? @billpress11, you have rediscovered the relativity of simultaneity. The observers in the ship agree that they both saw the light at the same moment. An observer who sees the ship moving past at 0.5c disagrees, and sees the light reach the rear observer first. This is a direct result of the fact that every observer agrees that light always moves at the speed of light. Neither the observers on the ship, nor the observer who sees the ship moving past at 0.5c, is "right." Or, if you prefer, they're all "right." It is, you see, all relative. Correct. To answer the original question, "static observers" (or better said moving at -0.5 c from the ship) will measure blue shift in the front and red shift at the back. But nothing is violated here, spacetime measurements depend on your position and speed in regards to the others. That is why Einstein called it "relativity"
DS, at 1/2c, how could both observers see the light at the same instant because the observer in the front is moving away while the one in the rear is moving toward the light source? We cannot add to or subtract from the speed of light so how can the, now different distances, be covered by light in the same time period in the same reference frame? To disprove Einstein's relativity, you can simply look at the existence of the absolute time shown on the universally synchronized clocks on the GPS satellites which have huge velocities relative to each other while special relativity claims that time is relative (i.e. different on different reference frames) and can never be synchronized on clocks with relative velocities. DS, at 1/2c, how could both observers see the light at the same instant because the observer in the front is moving away while the one in the rear is moving toward the light source? Because according to those observers they are neither moving toward nor away from the light source. It is only the observer moving at -1/2c that sees them moving toward or away from the light source. We cannot add to or subtract from the speed of light so how can the, now different distances, be covered by light in the same time period in the same reference frame? What "same reference frame?" There is the reference frame of the observers on the ship, and the reference frame of the observer moving at -1/2c with respect to the ship. Different observers in different reference frames see different things. It is, you see, all relative. This is lunatic, just another 2-way light speed measurement experiment unfit for drawing conclusions. We need one-way trip velocity of light measurements in order to test lightspeed anisotropy cq "Lorentz symmetry violation" cq Waldemar Voigt's initial assumtion about the ether. Guess what, all such measurements/experiments clearly prove that the speed of light is anisotropic and direction dependent. And they call it "strong evidence". DS, mo they are not moving toward and away from the light source at 1/2c, these observers are on the same ship and the two observers are not in different reference frames, they are both moving at 1/2c in the same direction. How are they in different time frames? I am not trying to disprove relativity in the same frame of reference, that I have no problem with. What I am questioning is whether there is a preferred reference frame (absolute) or not. means. I also note that you claim they are moving at 1/2c which is incorrect in their frame. In their frame they are motionless. Correct, the light source and the two observers are motionless relative to each other, they are in the same time reference frame. But they are not motionless, they are moving at 1/2c. Since the ship is moving at 1/2c the distance between the light source and the observers changes in the time period it takes for the light to reach the observers. The only way the light could reach the front of the ship at the same instant as the back would be for the ship to add and subtract its velocity from the speed of the light. The fact that light is red and blue shifted shows us one cannot add or subtract from its speed. Correct, the light source and the two observers are motionless relative to each other, they are in the same time reference frame. But they are not motionless, they are moving at 1/2c. In some other frame. Not in their own. the distance between the light source and the observers changes in the time period it takes for the light to reach the observers. You're changing frames from the one in which the observers and light source are motionless to the frame in which they're moving at half the speed of light without making a transform. You can't expect consistent results if you do that. DS, wrong on all counts, reread my previous posting. The comparisons are made in the same reference frame. Where did I change the speed relative to each other and where did I make reference to any other frame other than the fact the ship is moving at 1/2c. You just cannot respond to my questions and statements without reading into them what you know you would need to do to support your point of view. So unless you can come up a logical reason where I am not being clear or in error I am not inclined to spend any more time on this subject, I have another life. 1. The frame of the light source and two observers in the ship. 2. The frame of the observer watching the ship go by. The problem you're having is you don't recognize that fact. In the first frame, the light reaches both observers simultaneously. In the second it does not. The point at which you changed frames was the point at which you claimed the ship is moving at half the speed of light. This is incorrect in the frame of the two observers on the ship; according to them, the ship is at rest and the universe is moving backwards at half the speed of light. Schneibo, follow the suggestion & "find another life". Others of us who are actually engaged in the professions of the physical sciences are just so weary of the onslaughts from novices like you who will come onto this site claiming to have pics of Black Holes & that "MASS is a type of Energy", and now all this tripe. Go to Stummpy's private blog & entertain him & antialias with this worthless drivel. That is a nutshell is why one cannot test for a Lorentz Violation with a round trip of light. What may be a violation going one way is ALWAYS undone (unshifted) on the return trip. One way measurements using atomic clocks would be needed. Because they are at the same velocity as the light source. They are in the same reference frame. follow the suggestion & "find another life". Others of us who are actually engaged in the professions of the physical sciences are just so weary of the onslaughts from novices like you who will come onto this site claiming to have pics of Black Holes & that "MASS is a type of Energy", and now all this tripe. Go to Stummpy's private blog & entertain him & antialias with this worthless drivel. Well the train can add and subtract speed to the man walking in a train but any object in motion cannot not change the speed of light. Since motion cannot change the speed of light the frequency of the light must be changed. Therefore the distance light travels in the train is exactly the same whether the train is moving or not. So when the train is moving the light frequency is also shifted to a stationary outside observer but not for inside observers. I don't think "frame of reference" means what you think it means. It's a specific piece of physics terminology with a specific meaning. You're using it wrong. What you fail to comprehend is just because the light inside the ship does not appear to be shifted does NOT mean is wasn't shifted. It rather seems that what you fail to comprehend, is relativity in general, and all the implications that come with it. The two observers and the light source inside your imaginary ship are part of the same reference frame, and it does not matter how fast the ship is moving relative to other objects outside - as long as both obs. remain in the same r/f with the light source, they will both measure the same shift/speed of the light in all directions (relative to them), regardless of where they are located inside the ship. This has alot to do with how the time component is measured/perceived, as it is an inseparable part of the definition of "speed". With this in mind, there is actually no limit on how fast you can move - the more energy you put into going faster, the faster you will reach your destination (from your own perspective/frame). No amount of your nonsensical jibberish can alter this well known truth. Also, anyone truly engaged in "professions in the physical sciences" would certainly know this simple fact, thus exposing another of your lies. No, the clocks are not in the same frame as the satellites are moving with huge relative velocities. As shown on the paper "Challenge to the special theory of relativity" (March 1, 2016 Physics Essays), light is a wave of aether which seems a fluid. If you want to get the preferred reference frame, the inertial reference frame attached to the local aether will demonstrate the isotropic property of light. billpress, Da Schneib is right. The light and the observers on board the ship are not moving. It is only when you introduce observers not on board (or moving relative to the first set) motion comes into being. Since they are moving relative to the light source, their observations will be different from observers stationary with the light source. Xinhangen, if disproving Einstein is simple, please do so. The rest of the world will be informed of your resulting fame. No, the clocks are not in the same frame as the satellites are moving with huge relative velocities. **As shown on the paper "Challenge to the special theory of relativity" (March 1, 2016 Physics Essays), ***light is a wave of aether which seems a fluid. If you want to get the preferred reference frame, the inertial reference frame attached to the local aether will demonstrate the isotropic property of light. No, not shown in the Journal Physics Essays. It is a well known hangout of cranks with, at best, some very fringe ideas. I doubt anything will ever be 'shown' in that journal. Well Rguy, you are not the Engineer who has as part of his job description being the operation of a Gamma Ray Spectroscopy Lab, I am, I know the difference, I don't need help, you do. You have a fundamental comprehension problem with Einstein's Mass/Energy Equivalence Principle in Special Relativity. I don't have that problem because I comprehend the meaning of "Equivalence" whereas you & Schneibo do not. I know gamma ray PHOTONS are not ATOMS & that TRANSFORMATION of either results in equal gains on the other side of TRANSFORMATION equations which is what is meant by EQUIVALENCE no matter how novices, such as yourself, might try redefining the word EQUIVALENCE to suit your ignorance. IF this is true (big if), then God help whoever you work for. OK. Then explain your definition of equivalence to us poor, uninformed souls. This is the nonsensical gibberish that I have already told you convinces NO-ONE that actually knows physics. Oh? You've seen Schneibo's pictures of Black Holes that he claims to have seen? Unless you've seen the proofs for things he lays claims to, how does that "cast aspersions"? I guess it's all in the mind of the beholder as to who is the person casting aspersions isn't it Whyguy? ..............to you it would be. You would have nothing to say if it were not for attempting to redefine that which is contained within Special or General Relativity, and the reasons you keep screwing it up is because your degree in Journalism hinders you from comprehending that which is obvious. You have your world of fantasy, in the meantime I know the difference between MASS & ENERGY, no redefinition necessary. Stop equivocating. Give us YOUR explanation of what "mass-energy equivalence" means. Do you actually have the courage to try and do so? I am guessing not, but hoping so. So when the train is moving the light frequency is also shifted to a stationary outside observer but not for inside observers. Exactly. Which is what DS and others have been trying to tell you. So what is the point you are trying make? Mr Journalist.......I have told you numerous times I don't have my own "explanation" for anything within the contexts of Special & General Relativity, Einstein has already given the "explanation" & he didn't need help from Benni & I have never disagreed with anything within those theses, that's your forte, after all, you're somebody who thinks Black Holes were predicted in those theses, not me. Simply download a copy of Special Relativity onto your desktop & start perusing it if you can't afford a textbook. I learned it in the classroom from a textbook. Of course it would help if you had the assistance of a Professor in the classroom to whom you could direct questions, but the Differential Equations would be beyond you anyway, so why would you even bother going that far. So you STILL can not support your arguments? Do you not understand why nobody believes your claims to be well educated in these matters when you can not. I therefore, AGAIN, and for a final time, offer you a chance to prove me wrong by giving your explanation of the meaning of mass-energy equivalence. Simple, prove that you're right.........that MASS is another type of ENERGY. I know you can't find that in Special or General Relativity, but there are a lot of Tinfoil Hat sites at which you could probably find dumb statements for the kind of material like what you're hypothesizing, you know..... the kinds of places journalists like you frequent because you relish quaint explanations for those with minimal background in science. So in the process of proving you're right, how about if you Copy & Paste the section of SR or GR where Einstien predicted the existence of Black Holes..........do you know where to look? Talking sh*t. As usual. Prove it, sh*t for brains. Where is your proof? DO NOT LINK TO THE IDIOT CROTHERS. Or I shall laugh. A lot. You have been asked numerous times on this site, so I'll say it again - put up or shut up. Nuclear engineer my arse. You could probably fix a kid's bike. Maybe. End of. OK then jonesy, you know so much about SR & GR, you tell us where in either thesis to find the section in which Einstein predicted the existence of BHs ? Odd isn't it, that no matter how many times I ask this question, you'd think a quick & concise response would be easy to come by, but I never get one, just the usual foul mouthed name calling routines from the usual suspects. How about every time the equation E=mc2 appears. ...but there are a lot of Tinfoil Hat sites at which you could probably find dumb statements..
"The implications of E=mc2 are profound. For centuries, scientists had considered energy and mass to be completely distinct and unrelated to each other. Einstein showed that in fact, energy and mass are different forms of the same thing. Einstein himself was surprised by the finding, calling it "amusing and enticing" and wondered "whether the Lord is laughing at it and has played a trick on me."" Also, have you considered the implication of your wild claims for the conservation of energy? Or are you saying that is wrong too? @Benni You could derive it for yourself, it only takes some basic algebra and calculus. It isn't up to me to show something that is already well accepted within that particular field of study. YOU are the one coming on here making bald statements and assertions, with a total lack of evidence. So, I'll say it yet again - show us your work. If you haven't got anything (an absolute given), then your statements will continue to be rightly derided. You are no better than the EU nutjobs who can never back up their bald assertions. All mouth, no trousers, and even less maths. Tell us what Sgr A* is. No bald statements, such as "it's electric woo." Show us, without invoking any other woo (such as non-existent electric Suns), how your hypothesis matches the observation that it is an extremely compact source of ~ 4 million solar masses. Or, show us that the mass estimate, based on the orbital parameters of other stars around it, are wrong. Lots of lovely maths to do there. So that'll rule out our EU friends. Explain how the Inverse Square Law of Gravity for all stellar mass es not apply to the stellar masses dubbed Black Holes. The Inverse Square Law succinctly proves that gravity is maximum at the surface of any stellar mass & is zero at the center, this is the modus operandi for gravity upon which Einstein derived his Field Equations for the computation of the forces of Gravity. Then, along come the BH Enthusiasts with their Schwarzschild Black Hole Math. This to contradict GR with a fantasy theory that gravity can somehow rise to infinity at the centers of stellar objects of a given mass as that given mass is squeezed into an increasingly smaller volume by which action additional gravity magically shows up out of nowhere with no change in mass. Black Hole theory is based upon a counter intuitive concept that GRAVITY is not MASS DEPENDENT, I challenge you Jonesy to find that concept in GR. Where's the surface of a black hole? It's not the event horizon. To an infalling observer there is nothing special at the event horizon. An infalling observer cannot tell they have passed it. As for the singularity, that's merely a mathematical artifact. caused by the fact that we have no theory of quantum gravity. Most physicists expect that when we figure out quantum gravity, the singularities calculated with GR at the centers of black holes will disappear. It's just an indication that we don't have the right theory for it yet. Just like the Ultraviolet Catastrophe that preceded (and motivated) Planck's original quantum theory. It seems that you have doubt about my claim. Please just have a look at the fact shown by Wikipedia on GPS: The GPS concept is based on time and the known position of specialized satellites. The satellites carry very stable atomic clocks that are synchronized with one another and to ground clocks. That is, after all corrections, the clocks are showing the same time. The time shown on synchronized clocks on all reference frames is the absolute time. If you still have idea about special relativity, you should remember that special relativity claims that clocks with relative velocities can never be synchronized because time is relative. Just use your own logical reasoning. It's straightforward. blah, blah, blah........Black Hole theory is based upon a counter intuitive concept that GRAVITY is not MASS DEPENDENT, I challenge you Jonesy to find that concept in GR. Tell us what Sgr A* is. Do the maths. Total nonsense. If time was the same in all reference frames, they wouldn't need to correct for SR and GR! GPS proves SR and GR. The corrections are done with the trial and error method to make the clocks universally synchronized, not for the relativistic effects, nothing to do with relativity. It is relativity believers who misinterpreted the corrections as relativistic effects. On the other hand, if you know special relativity, you should know the relativistic effect caused by relative velocities can never be corrected because each satellite has different velocities relative to other satellites. There is no way to correct the clock with a single amount. If there is indeed an effect caused by velocity, it is the velocity relative to aether, which is almost the same to all satellites, not the velocity relative to each other as claimed by special relativity. Where's the surface of a black hole? It's not the event horizon. To an infalling observer there is nothing special at the event horizon. ........and how do you know this? You got some pics you'd like to show us proving this? Where in GR does such a computation exist such that infinite gravity can exist at the center of a stellar mass BH? To do this you need to prove gravity is NOT MASS DEPENDENT & no such law of TESTABLE physics exists. You are hereby awarded the Darwin "ignore user" award for December 2016 and are now entitled to ignore a caution extreme high voltage sign of your own choice. You are now getting incoherent in your demands for evidence of well established facts while spouting your own unsupportable postulates. If you cant accept that GPS satellite atomic clocks which have nanosecond per day accuracy and stability have to be 'massively' offset by microseconds per day because of correctly calculated SR and GR offsets you might as well throw your GPS unit away: And go back to Morse code and valve radios. Where in GR does such a computation exist such that infinite gravity can exist at the center of a stellar mass BH? Seriously, Benni, you really are an idiot. Try proving some of this crap. Mathematically. Difficult, I know, but at least bleeding try. Yes? Utter shite. Sorry mate, but you haven't got a clue. Eh? Technically, anybody that uses the word 'aether' should be consigned to the bin of eejits. No offence. blah, blah, blah,........here is no way to correct the clock with a single amount. If there is indeed an effect caused by velocity, it is the velocity relative to aether, which is almost the same to all satellites, not the velocity relative to each other as claimed by special relativity. Crap. End of story. Jesus, how many people subscribe to this anti-Einsteinian journal? I've had a quick read through the crap in that particular rag; how many f***wits are claiming Einstein is wrong? You, and a quite few others. Now p*ss off and leave scientists to actually get on with doing science, without f***wits like you getting in the way. OK? TL;DR? You're an idiot. Now bugger off. Seriously Jonesy, you really are an idiot for believeing gravity is not MASS DEPENDENT. Try proving it instead of going off on another one of your name calling binges that has become your greatest forte here. Of course you think application of the Inverse Square Law is mathematically difficult, it would be for someone with your meager knowledge of Nuclear Physics who imagines infinite wells of gravity can exist at the centers of a BH stellar mass. Tinfoil Hat award on your horizon. Please present your logical reasoning here!